To help travelers across the country this Memorial Day, Appitalism.com , the mobile app superstore, has put together a list of the top apps to help avoid traffic and truly maximize your time off. Traffic V1.04 (Free for the Apple iPhone) - Based on your current location, or any other location you configure, Traffic will retrieve the current traffic conditions in the area and display them on a map or in a customized listing. Easily switch back and forth between map view and list view to monitor all of the traffic around you. 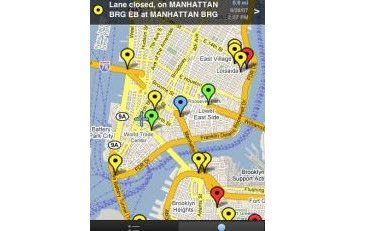 Traffic View (Free for the Apple iPhone) - With only one purchase, get coverage for all supported cities in just one app! Based on your current location, or any other location you configure, Traffic View will retrieve the current traffic cameras in the area and display them on a map or in a customized listing. How's Traffic? ($.99 for the Apple iPhone) - Do you check traffic conditions before you leave the house? Did you just miss “traffic on the twos” on the radio? The days of constantly checking traffic reports are over. With How’s Traffic? all you need to do is tell us what to look for and we will do the rest. Whether you are making your daily commute or going on a trip, we have the traffic information that you need. Beat The Traffic-V2.0 (Free for the BlackBerry) - Beat the Traffic® is the easiest way to enjoy a hassle-free commute in the USA and Canada and provides live traffic maps, showing traffic speeds and incidents on major routes for more than 100 cities. Do you have any other smartphone apps that you like for traveling? If so, please share them with your fellow readers in the comment section below. Have a great Memorial Day weekend.